Did you ever feel this way? "You know God wants to use you, but where is He?" "I look at others and they seem to have a better ministry than I do"
"Does anybody have this 'God Thing' working?" "When I preach I feel the spirit moving, but people are not changed for the long term. Some get excited but in a few months, they settle back down." "I have had dreams of ministry, preaching to crowds and pastoring a big church, yet no doors are opening to me and I do not see any progress on making my dreams come true. I even had some prophecy over me, but were are the results?" "There is strife everywhere, and cliques run my church, and certain people seem to have undue influence. 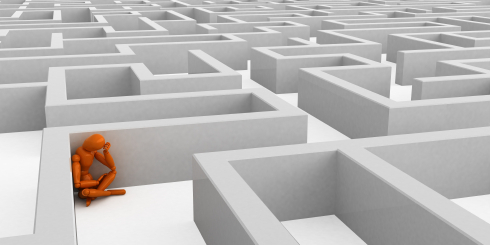 We go through program after program, but real change seems hard to come by." "Where are the answers to prayer? I lay hands on the sick and they do not recover. Our church has never had even one miracle healing (or only one every 5 years or so). I follow this teacher and that teacher, go to the seminars and programs. I have been to so many that I feel like I am living off alphabet soup and one liners! As a minister I want to see God move, but where is He? It is me or Him?" "We stir up the people with rousing music and sermons, yet I now understand what it means when God says "Hoped deferred makes the heart sick." After a while people just give up and go through the motions. They don't know what to do, so they keep coming, but most of it is empty." "Where is my church growth? The people here are so hard to the Gospel, it is like trying to plow the Rock of Gibraltar with a stick made of Jell-O." As you read the pages of OK, GOD, Now What, you will experience truth that hits you in your core and makes you aware that you do count, your life is important, your calling is real, and you do have a Helper that can make the difference. You will begin to experience the awesome power of Truth + Belief = God Results. You will discover what you thought did not apply, when seen through different eyes, are the answer to everything God promises. And in the process your very core will grow and expand with joy like you only dreamed of. Jerry had been a minister for over 30 years. He had seen God move powerfully, with stadiums filled with excited believers and new salvations by the hundreds and thousands. But they did not stick; less than 1% stayed in church for more than a year or two. He studied the Bible, went to seminars and programs all promising to change his life forever. He had even sent people to seminars promising the presence of God and lives changed forever. God may have been there, but changed lives were hard to come by, and other than being born again or being filled with the Spirit, there was little evidence of any forever changes. Jerry was worried, he kept the people in his church busy with programs and small groups, but when the young adults went off to college, they dropped Christianity. He got a degree in psychology, but Jerry knew that Jesus never did the kind of counseling he was learning to do. And results were few. His income was fine, but it depended on just a few key donors. His wife, Lois, was helping in ministry, but she was so busy she was meeting herself coming and going. Both of them felt pressured and unsure, and where was God? They saw some miracle answers but not many, and not many lately. Then a friend gave him OK, GOD, Now What? It sat in his office with the other 45 books people had given him in the last few months. He figured that if he read one a month, it would take him almost 4 years to read all he had, and people kept bringing him more books. As he looked at the stack, he could not get the title out of his mind. He saw it was written by a businessman who was also a lay teacher and minister. The promises of the book were too good to be true. Yet the guy said he had used those same principles to make hundreds of millions of dollars. So Jerry took a chance and started to read OK, GOD, Now What. As he read he saw the almost every statement had several scriptures to support that statement. He had never seen them applied so directly and simply. He concluded that this guy might be on to something, so he read some more. The insights confused him. They did not fit his theology, yet they fit the Scriptures like a glove. How had he missed such simple, yet practical insights? At first the Chapter on Understanding the Need for New Attitudes seemed almost trite. Yet they were powerfully applied and really shook him up. At first he got mad and just waded through them. Could all those Scriptures be that simple and direct? Did they really apply? If they were true, why did they not seem to work? Where was something new? He wanted some new and exciting revelation. But Jerry was starting to be challenged by Truth he had always ignored. Then as he read more he loved the scientific explanations that supported those scriptural insights. He kept reading. Then he got to the Affirmations Magnets and decided to start doing some of them. They sure had a lot of Scripture and were logical and properly applied. Yet the Christ Magnets had an entirely different mindset or world view than he had ever experienced. So he committed to doing at least 10 minutes a day, but that grew to an hour of the Affirmation Magnets every day. After all, they were full of Scripture and all that Truth could do him some good. But he was skeptical about that repetition thing. Doing the same ones every day for 90 days really challenged him. And the explanations on how to preach for effective results were really different. Could they work? Was the subconscious mind really that important? As Jerry read OK, GOD, Now What, he began to understand that he had been using cognitive mind approaches to discipling people in Christ and not subconscious, heart writing tools like Jesus had used. Jerry discovered that modern science is proving that we live 95% of our life out of our heart or the subconscious mind. The cognitive techniques Jerry had learned in school, and so had all his people, were familiar but only tackled parts of the remaining 5% of their lives. He had been using the wrong tools for behavior modification, life change, habit formation and discipling. It was no wonder that all that effort produced so few results. Jerry kept doing the Affirmation Magnets and even used some of the teachings in his sermons. But they seemed to raise more questions than he had answers for. The answers were in the book, but could God really be that involved in the biology of the mind? And does zoe mean all of that? What Jerry became aware of was that his counseling sessions started to get shorter and more effective. His wife appreciated that the tensions at home were less and Jerry paid more attention to her and the kids. Jerry was even giving her real attention almost naturally. She loved it and she loved him. Jerry was experiencing the power of Truth + Belief = God Results. When Jerry prayed with people, he started seeing more amazing answers. Jerry even found himself enjoying the Lord more in the small things of ministry. People started commenting that his sermons were really having an impact on their lives. Jerry had prayed for a man with back problems and God had healed the man's back as he prayed for him. In another case, a lady got out of wheelchair she had been in for 12 years. Jerry was starting to discover that Christianity was fun. God was great, good and wonderful, and people were getting healed. And in the process Jerry understood that the Christ Identity he had talked about for years started to become real to him. Jerry was knowing how loved and special he is to God. And God was becoming a Friend and not a cruel master. As his wife, Lois, started to notice the changes in Jerry, she wanted to read OK, GOD, Now What also. Now they do the Affirmation Magnets together. Even the kids have turned some of them into songs. Both of them are now excited as they discover who they really are in Christ, and you know what? They found God is bigger than any program, and they see His hand move like never before. And the best part for Jerry was that his relationship with God in Jesus was growing and impacting every part of his life for the better. And the church was growing with Holy Spirit powered signs and wonders everywhere. Real Bible miracles were everywhere! Perhaps the biggest impact was that as he continued to develop his Christ identity, he was no longer afraid to offend those key donors with the truth and love found in the Scriptures. Jerry felt free in God at last. And it had been easier than he had ever thought possible. What other's say about Donald's book, OK, GOD, Now What? 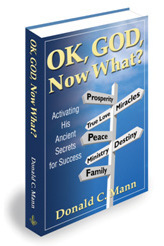 Go to: OK, GOD, Now What? Copyright 2013 Covenant Peace Ministries. All Rights Reserved.